DeAndre delivers an exceptional lesson experience and ranks in the top 15% of our teachers nationwide. My daughter is extremely shy and introvert, she said she felt comfortable with DeAndre. From my observance of him interacting with her he is very patient and is able to work well with young beginning students. My daughter is 11 and her only experience was playing with her strings class last year in 5th grade. You can tell DeAndre has a very calm personality that translates into his lessons with his students. That is such an important quality to possess when working with young beginning students. Thanks for a great lesson we look forward to many more with you. DeAndre has been wonderful with my 8 yr old son. He's already learning so much more than he did with his previous teacher! And my son is very proud of his own progress! 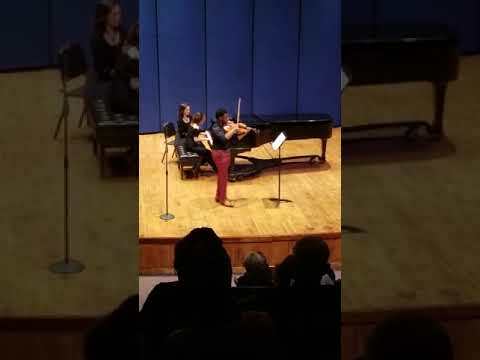 I started taking online violin lessons from DeAndre a while back and it's amazing how much I have learned from him already and I know there is still a lot more to come! He is very passionate and knowledgeable! He's also very patient in explaining and always has several instruments on hand to explain things even further. I very much look forward to every lesson and to getting better and better at playing my violin. I would highly recommend DeAndre! I'm completely new at the cello, but I'm learning a lot from DeAndre. I don't have much natural talent for this instrument, but he is very patient with me. DeAndre is very patient and knowledgeable with my daughter. She has learned a lot being that she has no prior experience with the Violin. Awesome teacher and we look forward to working with him again. DeAndre is the best teacher I have ever had!!! He explains everything so clearly in a way that I can easily understand it. Since I started taking lessons from him, people have been telling me my playing has improved so much!!!!! Without him I don't think I would have passed the orchestra audition!!!! I highly recommend him!!! !